October 2013 Fiestaware Tent Sale! Boy am I LATE on this post. But better late than never? If you haven’t heard already, the Fiestware Tent Sale is happening THIS WEEKEND. Thursday, October 3 through Saturday, October 5. More information can be found here. I won’t be going (AND I’M REALLY SAD ABOUT IT) but I hope to hear all about it! Happy tenting! June 2013 Fiestaware Tent Sale Dates! The details are always the same and I’ve posted them each time so I don’t feel like posting them. Go ahead, call me lazy. I already know the deets. I’m a veteran of the tent sale. Visit the Fiestaware page to get the full run down. Happy tenting! (insert clinking noise of dishes). It seems like it was just a few days ago I went to the last tent sale! But here we are again! Are you going? I am! Three of us went to the tent sale this year: Ian, who was in need of a dishware makeover, and Natalie, who was in it to see what it’s all about and perhaps a few things. I was the only seasoned veteran as these two have not experienced the tent sale. They were in good hands. I obtained crates on wheels (which can be purchased at Staples or Office Depot) to make our haul a little easier and we were all armed with socks to put on our hands. The factory is only about an hour away from Pittsburgh so getting there was super easy. 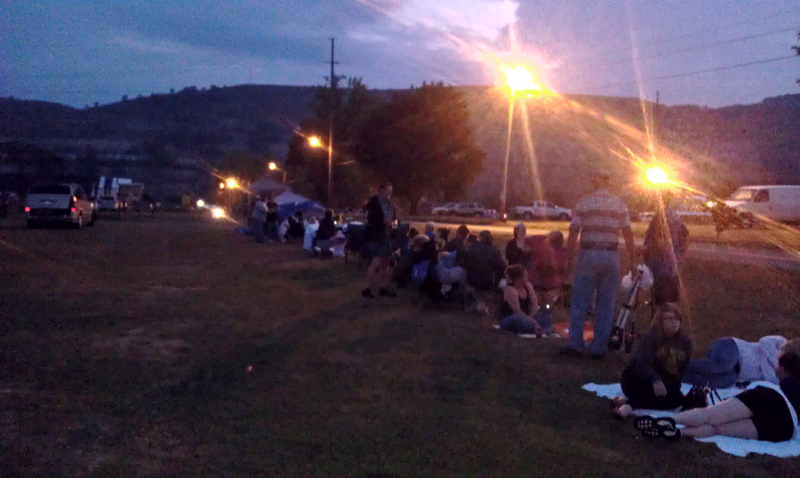 We left at 4 a.m. so we could get a sweet spot in line for the first crack at all of the Fiestaware. The line at around 5:10 a.m. Workers started passing out tickets at 7 a.m along with a price list. We were 116, 117, and 118, just at the front of the second wave to get in the tent. Once we got our tickets, we went to Newell Diner, about a minute down the road, for some fuel. 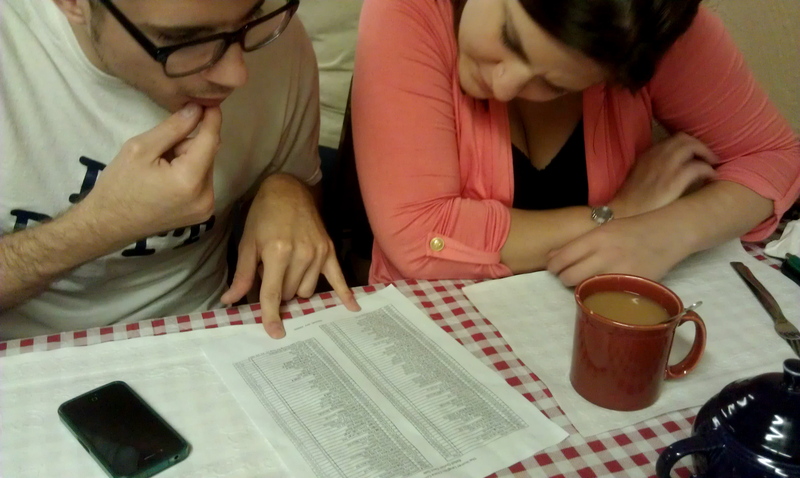 We placed our orders and immediately started reviewing the price list. What I always get. 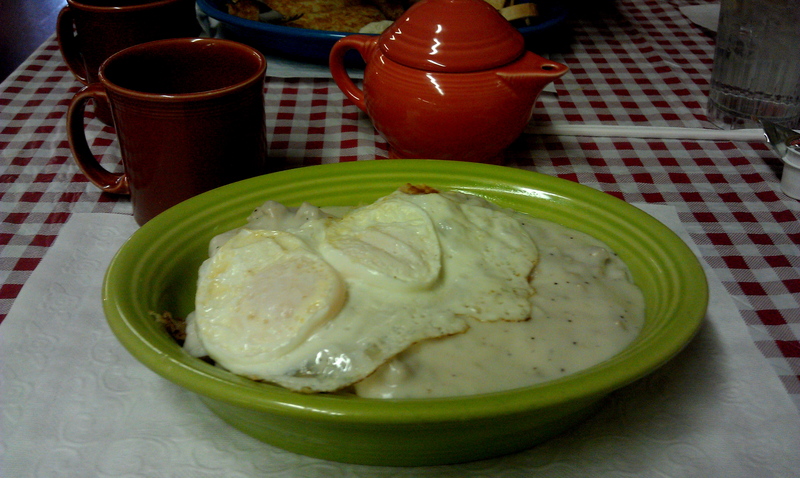 Coffee and the biscuit bowl. We ate, finalized our list of what we want to get, strategized as to what to grab first (bakeware always goes fast), paid for our food, and got back in line. They weren’t suppose to let anyone in until 8:30 a.m., but since it started to rain, they let the first wave in early. Thank goodness we got there in time because the second wave didn’t go in yet. Phew! This is the view at the entrance of the tent. And, unfortunately, the only photo of the tent I took. It happens every time! Once you get in that tent it’s game on. You are on a mission to get what you want and don’t have time for photo taking. If you really want to know what it’s like, go for yourself. You will be happy you went. Hall China also has a tent. Much, much smaller but they have some gems there. Like this Ronald Regan tea pot. I regret not buying it. The one thing that I wanted and did not get (or see ANYWHERE at the tent sale): deviled egg dish. I will get it next time!!!! All in all, this trip was successful. I got what I wanted for the most part as did Ian and Natalie. I can’t wait to go again! 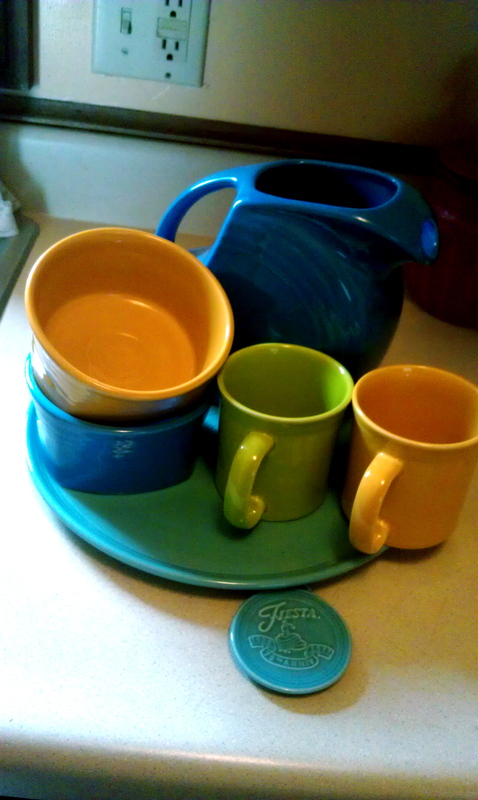 Happy Fiestaware Tent Sale Weekend! The Fiestaware Tent Sale has started today! I will be going tomorrow and will have a post up next week with the experience and the haul. To all those who are going – HAVE FUN! Fiestaware Tent Sale 2012 Dates Announced! Yes, ladies and gentlemen! The bi-annual tent sale has been announced! June 21-23, 2012! Make sure you get in line early or i’ll edge you out of some plates 😉 below are the details straight from their website. I think I may go down this year just to see what i can find… anyone want to caravan down? Hall China will have a tent of their own. The Retail Outlet will be closed June 20th and 24th. 1. Tickets will be given out each morning of the sale beginning at 7 AM. 2. Each person must be present to receive a ticket. No one under 16 permitted in warehouse/tent. 3. Customers will line up according to ticket number. 4. The sale will start at 8:30AM and run till 7:00 PM each day of the sale. 5. The gate will be closed at 6:30 PM to allow us to get everyone checked out. 6. You must stay in line until you receive a ticket and be in line when your number is called. 7. You must bring your own dolly. Retail Outlet dollies will not be available during the tent sale. 8. Once you have checked out you must go to the back of the line and receive another ticket. 9. If you are not in line when your number is called you will be passed over and must go to the back of the line. 10. We will be closed the day before (June 20th.) and the day after (June 24th.) the tent sale. 11. PLEASE MAKE SURE YOU RECEIVE ALL OF YOUR ORDER WHEN CHECKING OUT. ALL SALES ARE FINAL AND NO ADJUSTMENTS WILL BE MADE AFTER YOU LEAVE THE TENT. 12. We accept Visa, Master Card, and Discover Card. No Checks! 13. There is a limit of 4 crates each time you go through the tent. 14. There will be chances sold on a gift package to support non profit local organizations. NO ONE WILL BE PERMITTED IN THE SALE WITHOUT A TICKET! NO OVER SIZED DOLLIES OR WAGONS WILL BE PERMITTED IN WAREHOUSE/TENT. 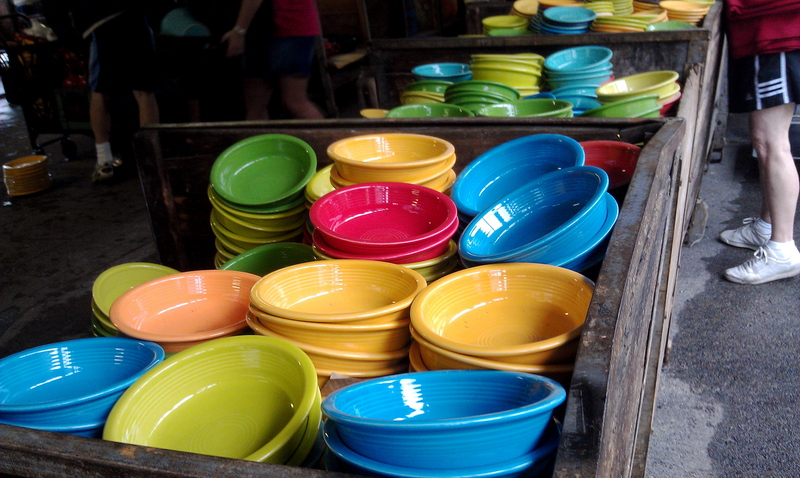 October Fiestaware Factory Outlet Sale Dates Announced!! the bi-annual tent sale dates have been announced!!!! Who’s going?? second year at the sale with a tent of their own. The Retail Outlet will be closed October 12th and 16th! 4. The sale will start at 8:00AM and run till 6:00PM each day of the sale. 5. The gate will be closed at 5:30 PM to allow us to get everyone checked out. 7. We strongly recommend you bring your own dolly. Retail Outlet dollies will not be available during the tent sale. 10. We will be closed the day before (OCTOBER 12th) and the day after (OCTOBER 16th) the tent sale. 11. PLEASE MAKE SURE YOU RECEIVE ALL OF YOUR ORDER WHEN CHECKING OUT. ALL SALES ARE FINAL AND NO ADJUSTMENTS WILL BE MADE AFTER YOU LEAVE THE TENT.